People who love great food will love Viking Sky. The ship offers seven unique restaurants as well as a substantial room service menu, and dishes across the board are excellent. Best of all, dining at six of the restaurants is included in your cruise fare. (The exception is The Kitchen Table, which really is as much about the excursion as it is about the meal.) 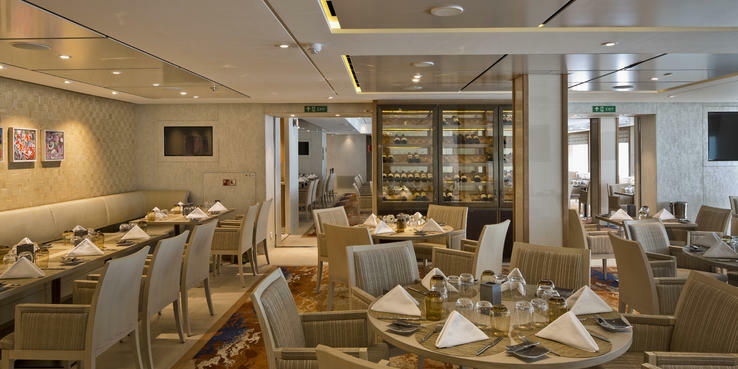 The quality of the ship's main dining room, called simply The Restaurant, is high, and service is outstanding, but passengers also are entitled to eat in each of the ship's two alternative venues -- Manfredi's and The Chef's Table -- at least once each cruise. For many passengers, those experiences are a highlight. No matter where you choose to dine, you'll get attentive service with friendly waiters, wine stewards and sommeliers who know the menu and wine and beer choices well. Waiters take orders on mobile devices, so choices are quickly relayed to the kitchen, meaning there are shorter wait times at the start of the meal and between courses. Most restaurants can accommodate special dietary needs and restrictions, but passengers sailing Viking Sky should make requests when they book and follow up with guest services or the maitre d' once onboard. Menus or placards designate heart healthy, sugar free and vegetarian selections. All meals are open seating, and complimentary house wine and beer are poured at lunch and dinner at all venues. The Chef's Table (Deck 1): Located on Deck 1, The Chef's Table is decorated in light browns, oranges and blues. It has tables for two, four and six, and there is a private room that can accommodate 12. Menus at The Chef's Table are set, and they're offered each night of your cruise. They rotate every three days so you can dine at the restaurant multiple times without having the same meal twice. Meals are themed by regional or related flavors, so you might get Asian one night, sweet and salty another, or Norwegian or French bistro on another. Diners get five courses, including a palate-cleansing granita, and each course (except that granita) is paired with a wine. (Passengers can pair with premium wines for an extra $25). We love the portion sizes, which are big enough to enjoy but small enough that you can eat the full meal without feeling stuffed. Because the menu is fixed, diners who have restrictions should notify the staff when they make reservations, as substitutions can be made but likely will come from Manfredi's. While there's no cost to dine at The Chef's Table, reservations are recommended. Manfredi's (Deck 1): Viking Sky's Italian restaurant offers made-from-scratch pastas, homemade soups, fresh fish and traditional rustic entrees. The venue is comfortable, with black-and-white marble floors, accordions hanging on the walls and an open prep area where you can watch chefs bake bread and chisel out pieces of Parmesan from a huge wheel. Tables of two, four and six are available, and large parties can request seating in the restaurant's private room, which accommodates 12 around a gorgeous wood plank table. (Anyone can use the room, but you have to make reservations.) Bring your appetite because, while portions are appropriately sized, chances are you'll want a little of this and a lot of that. In fact, if you can dine with a small group, do it so you can share because Manfredi's is the best restaurant onboard. To start off, there's the breadbasket, stuffed with crusty fresh bread, rolls and breadsticks. It's served with oil and vinegar as well as chunks of Parmesan. Starter options include caprese or panzanello salads, soft polenta and asparagus topped with a poached egg, and octopus carpaccio. You also can order any of the pasta dishes in a smaller portion. Pastas, which are perfectly al dente, include lasagna with meat sauce, gnocchi in herb butter and tomato sauce, and mushroom risotto. There's also a rotating pasta of the day, which on our cruise included an inventive and delicious reindeer Bolognese. Soups include pasta fagioli, cream of mushroom and chilled tomato with goat cheese. Entrees include veal cutlet, chicken Parmesan and a huge, fall-off-the-bone veal osso bucco, as well as a fresh catch of the day. The highlight of the menu is the bistecca fiorentina, a rib eye packed with flavor after being marinated in balsamic vinegar for 72 hours and crusted with spices. Vegetarians can pick from a variety of pastas and risottos. Desserts include a creamy, decadent Nutella panna cotta, deconstructed tiramisu and a dense and delicious pistachio torta. You also can pick from a rotating list of ice creams and sorbets. Pair your dessert with a limoncello liquor (for a fee). Make reservations before your cruise or once you're onboard to make sure you can dine at Manfredis. Viking Bar (Deck 1): While it isn't really a restaurant, you can get nibbles all day long at the Viking Bar. At breakfast, it serves pastries and muffins. (The selection varies slightly each day.) At lunchtime, you can try beef tartare with raw egg, onion and capers; shrimp sandwiches; and Norwegian gravlax as well as cookies (with some tasty sugar-free options). Later in the day, it's back to more cookies and muffins. We like the Viking Bar next to the Viking Living Room for a quick bite between meals. Portions are small but take the edge off. The Kitchen Table (Deck 1); $180 to $260 per person: At least once per cruise, Viking Sky offers a shore excursion called The Kitchen Table. The excursion takes passengers into local markets in the morning with the ship's chefs, where they haggle with vendors, pick through produce and sample the wares (and wines! ), eventually returning to the ship with an armload of food and vintages, which will be prepared as the dinner for the group that night. Chefs usually have a meal in mind based on the market they're visiting, but they take suggestions from passengers, so if there's something you love -- or hate! -- speak up while you're shopping. The chefs are joined by a local guide who helps translate and also talks about regional food specialties. The group gets back together in the evening for the multicourse meal, which takes place in the ship's Kitchen Table restaurant. The space is gorgeous and modern, with large-screen TVs so passengers can watch as the chefs prepare dinner. The centerpiece of the room is an enormous marble table, which has an ice bar running through the middle that can be used for items like crab legs and raw oysters. While you can join the chefs in cooking and plating meals, most passengers are content to sip wine and eat while the chefs do the hard work, including explaining how the ingredients were included in each course. Skip lunch if you book this, as the meals run multiple courses and are large. It's OK to send away a plate with food still on it; you won't go hungry. The Kitchen Table is limited to 12 passengers. You can sometimes prebook it ahead of your cruise, but watch for it on your daily planner, too, as you might be able to join at the last minute. Kitchen Table experiences take place only in ports that offer vibrant markets. The Restaurant (Deck 2): The Restaurant is the ship's primary dining room, and it is the busiest restaurant each night for dinner. It's also open for breakfast and offers a quiet respite from the World Cafe buffet. It serves lunch only on sea days and very select port days. The layout of The Restaurant maximizes the natural light from the windows that completely surround the space, and it provides tables and seating for parties of two, four and much more if needed. It's decorated in shades of blue, and tables are draped in crisp white tablecloths. It includes an enormous wine case as well as a small, seldom-used bar that offers seating for six. There are no set dining times or tables; just show up when you're hungry during mealtime, and you'll be seated. The Restaurant doesn't take reservations, but you won't need them anyway, as there is plenty of seating. Breakfast options include a fairly large array of hot and cold dishes. You can get made-to-order eggs as well as chef options like the creole omelet, a delicious slightly spicy vegetarian breakfast dish served with salsa verde, avocados and tostones. Eggs Benedict, pancakes and waffles also are available. Cold options include cereal, yogurt, lox and mixed berries with mascarpone cheese. Meat-lovers can order a breakfast steak. Lunch is a rarity at The Restaurant on Viking Sky, but when it's offered, you can choose from salads and sandwiches, soups, burgers and hot dogs. You can also order more formal options, like seared fish, entree-sized salads and pastas. Desserts include cakes, tarts, fruit, sorbet and ice cream. The menus at dinnertime rotate, so you won't get repeats on a weeklong cruise. There's a solid enough variety to keep even the pickiest eaters content. Salads and soups are always offered as starters, with other options like crispy soft-shell crab and fruit minestrone. The restaurant has an impressive breadbasket, too. (Try the jalapeno cornbread.) Main courses are fairly inventive, and seafood is a mainstay most nights. You might order items like lobster thermidor, pancetta-wrapped chicken, seared liver or filet mignon. You'll also find a host of regional dishes. Our favorite part is the nightly regional meal, which is a three-course menu designed using the flavors and traditions of the port the ship visited during the day. So, for example, after a visit to Valencia, you might get chorizo and bean soup as a starter, lemon chicken for a main course and cinnamon raisin rice pudding for dessert. Passengers can go for the whole menu, or pick and choose the courses they want. Items, including poached salmon, grilled chicken breast and New York strip steak, are available every day, as is caviar, which is market priced. Always-available side dishes include a variety of veggie options, like green beans or creamed spinach, as well as mashed potatoes. Desserts, too, change every night, and might include options like a fruit tart or panna cotta. Everyday options include cheesecake, sorbet and ice cream, as well as a cheese and cracker plate, served with fruit chutney. Vegetarian and heart-healthy options are designated on the menu, but waiters and waitresses can help you make appropriate choices based on preference, health or allergies. Viking upgraded its included wines and Champagnes in 2017, and passengers on our sailing seemed to enjoy the rotating selection each night, when one red and one white are offered. If a passenger doesn't care for the house selection, he or she can elect to pay for a premium brand. If other house selections from previous nights remain, a passenger might select that one instead. Passengers on Viking Sky also have a large variety of interesting included beers, with standards like Budweiser and Corona, craft options like Brooklyn Lager and Aegir, plus lots of imports. The World Cafe (Deck 7): The World Cafe is the ship's buffet restaurant, spanning the back of Deck 7. The space is bright and airy, thanks to floor-to-ceiling windows that flank the whole restaurant. When the weather cooperates, the windows can be opened to allow in fresh air. It's set up with two sides that virtually mirror one another, though one side boasts a gelato/ice cream area (which seems to always have an incredibly long line), and the other a pizzeria. Most of the seating is set up for two or four, though a few larger tables can be found. At the back, you'll find the Aquavit Terrace, which has folding glass doors that can be opened all the way across in pleasant weather. You'll also find outdoor seating, all at tables for four. The World Cafe is busiest in the morning before shore excursions depart and in the afternoon, when hungry passengers return from their time in port. For all meals, you can order entrees a la minute -- a daily specialty that is made fresh when you order it. At breakfast, that usually means eggs, and the ship offers some creative Benedict-style egg dishes. Made-to-order eggs are also available every day. There's also a good variety of yogurt, cheese, cereal, pastries, cold meats, smoked and pickled fish. You can pick up a smoothie of the day at the Aquavit Terrace Bar, which is at the very back of The World Cafe, dividing the two sides. Lunch features a small salad bar, with several premade salads (lentil or curry chicken, for example) as well as fresh greens and some toppings. You can grab cold cuts and cheese, too. Hot items, such as grilled fish or eggplant Parmesan, also are offered, and selections vary each day. A carving station offers a rotating selection of meats, like whole chicken or turkey breast. You can get made-to-order pasta and slices of pizza, too. There's a large dessert bar, with lots of cake and torte options, as well as the aforementioned gelato bar. While there are usually lines for gelato, they do move quickly. Waiters serve drinks, including complimentary house wine, beer and soft drinks, though you can serve yourself coffee, juice and water if you choose. At dinner, the highlight of The World Cafe is its amazing sushi and seafood bar. Choose from jumbo cocktail shrimp and huge chilled crab legs, with cocktail and other assorted sauces. The sushi bar offerings rotate each night, though meticulously sliced salmon and tuna sashimi always is available. You'll also find nigiri and gorgeous rolls, such as spicy eel or Philadelphia rolls. The quality is excellent, and it's all photo-worthy. The bar includes all the fixings, like wasabi, soy sauce and pickled ginger. Grab some chopsticks, and you'll feel like you're dining in a high-end sushi restaurant ashore. Otherwise, the buffet offers a decent variety of entrees, such as baked fish or pork. There's also a carving station, as well as the small salad bar. You actually can order from the menu at The Restaurant while dining in The World Cafe; just look at the menu on your TV ahead of your meal and order from your waiter. It's a nice option for those who want to skip the somewhat more formal main dining room (jeans are perfectly acceptable at the buffet) but still enjoy the dishes there. At dinner, waiters come by to pour house wines as well as beer and soft drinks. The World Cafe does close between meals, and it shuts down for breakfast fairly early on days Viking Sky is in port, so check your daily schedule for hours each day. The Pool Grill (Deck 7): The restaurant, open only for lunch, offers a wide variety of burgers, from plain to fancy. It also serves chicken wings, shrimp sandwiches, mahi mahi, hot dogs and Reubens. All sandwiches are served with fries or onion rings as well as coleslaw. There's also a small salad bar, which serves leafy greens, pickled veggies, fruit and premade salads, like potato or lentil, which also are served in the World Cafe. A fried vegetarian patty is available as well. If you really want to go all-out, try the Pancho Villa burger, served with cheese, guacamole, aged blue cheese and arugula along with a spicy aioli. Mamsen's (Deck 7): Mamsen's is all about comfort food, albeit Norwegian comfort food. The restaurant, which actually is a food kiosk located in the Explorers' Lounge, serves fresh, hot, delicious waffles in the morning. They're made to order, and you can top them with any number of goodies, like sour cream, berries, cheese and chocolate sauce. You can also nosh on pastries, herring and fruit here in the morning. For lunch, you'll find the same open-faced sandwiches you get at the Living Room Bar: gravlax and steak tartare, for example. Come back late at night if you're feeling peckish to enjoy the bacon and pea soup, as well as cold cuts. Wintergarden Conservatory (Deck 7): The Wintergarden hosts a traditional afternoon tea every day at 4 p.m., where passengers can select from a huge tea menu, dine on finger sandwiches and macarons and enjoy hot scones with clotted cream and jam. Entertainers perform live music during tea service. Get to the Wintergarden promptly if you want tea; space fills up and the service will trickle out onto the pool deck. Room Service: Perhaps the most underrated dining option onboard, room service is available 24 hours a day to all passengers. It's a wonderful perk, especially when you're hungry between mealtimes and the restaurants are closed. Breakfast can be ordered by phone or by leaving a door hanger on your cabin doorknob the night before. Breakfast offers hot and cold items, including eggs, omelets, bacon and oatmeal. Cold items also are available, including fruit and yogurt. There's also a new smoothie available every day, which you can write in on the door hanger -- it's not otherwise on the menu. In fact, you can write in specific items -- if they're available at The Restaurant, they're available via room service. The 24-hour menu is extensive and includes gravlax, veggie sushi, burgers, pasta, poached salmon and salads. We ordered room service several times during our cruise, sometimes with somewhat difficult instruction, and each time it was delivered correctly. The attendant will walk you through your order each time to make sure nothing was missed. Room service even is available on disembarkation day, a rarity on cruise ships.